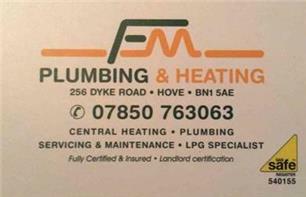 FM Plumbing & Heating - Central Heating Engineer, Plumber based in Patcham, East Sussex. Invoice history based on 107 reviews. I'm a local experienced and highly professional plumber and heating expert ready and willing to help you, whatever service you require. At FM Plumbing and Heating Services, I can offer an array of domestic heating and plumbing solutions. From central heating and boiler repairs to full installations, FM Plumbing and Heating will make sure your work is completed professionally and efficiently. I'm gas safe registered which gives you the reassurance that we are qualified and authorised to deal with your domestic heating and plumbing. We are available to you when you most need our services.